A monument commemorates Burke and Wills, Major Mitchell and the captains of the first Murray paddle steamers which arrived in Swan Hill from South Australia in 1853. 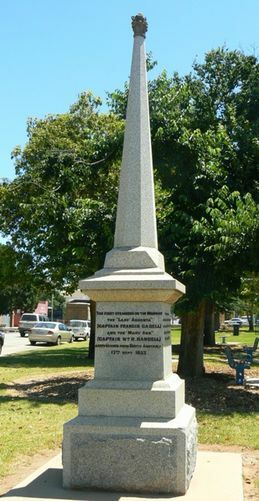 The memorial was originally intended to be unveiled on the 12th September, 1914; the anniversary of the departure of the Burke and Wills expedition from Swan Hill in 1860. Swan Hill. At a meeting of the explorers' memorial committee on Thursday night it was decided to invite Sir John Forrest, whose exploratory work in the early days of West Australia was of much value, to perform the unveiling of the memorial on 12th September, on the occasion of the anniversary of the departure from here of Burke and Wills in 1860. On 17th September, the anniversary of the arrival of the first steamer on the Murray River, under Capt Candall (sic) in 1853, will be celebrated. Prof C. R. Long, of the Historical Society, and members of the Victorian, New South Wales, and South Australian Government will be invited to attend the unveiling. The monument will cost about £150. Ballarat Courier (Vic), 4 July 1914.